A powerful new hero of Midas Kingdom debuts in League of Angels II now! 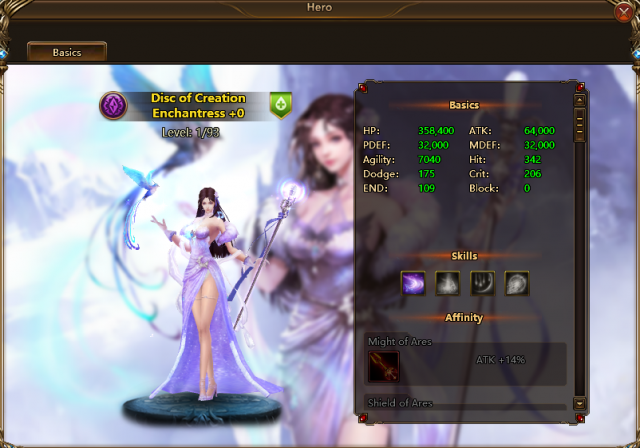 Enchantress, Disc of Creation, is the fifth Artifact hero in Midas Kingdom. She is known as a powerful healer, and she can compose the most heart-strring melody in the land. Enchantress will be available in X-server Resource Tycoon Apr. 16th to Apr. 21st. Hurry up to summon this powerful hero and make her fight for you! Enchantress is known as a powerful healer. She can heal the entire squad and reduce enemy's rage. Let's take a look at her abilities. Heal the entire squad for (190%+7100) HP and increase Rage by 300; also casts a "Anthem of Rebirth" on the 2 allies with the lowest HP that heals 40% of their missing HP per turn for 2 turns. Deal (184%+6860) DMG to all enemies and apply a stack of "Sonata of Ruin" to reduce their Dodge and ATK by 10% for 2 turns (can stack up to 2 times). ①. When Enchantress is attacked, she heals herself and the ally with the lowest HP for 10% HP and increases Rage by 100; ②. Increase Enchantress' healing effects by 5% of her max HP. ①. Unique Effect "Vitality": Increase the max HP of the entire squad by 30% of Enchantress' max HP; ②. Enchantress is immune to Rage stealing or reducing effects; ③. Increase Enchantress' healing effects by 25%; ④. Unique Effect "Restrain": Reduce the Rage gained by enemies from all sources by 40% for 5 turns. Hurry up to invite Enchantress into your squad. Play League of Angels II from Apr. 16th to Apr. 21st and join the X-server Resource Tycoon to compete for the powerful hero! Stay tuned for more contents and have a great time playing LOA II! Next：New Clothing Easter Bunny: Celebrate for Anniversary & Easter!